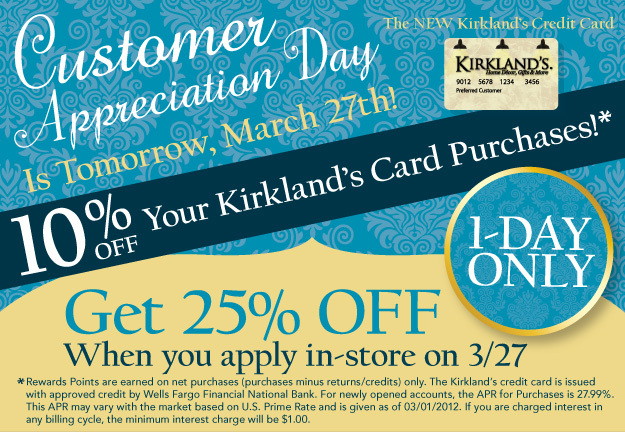 A Day Late and A Dollar Short: Kirkland's - Introduces New Credit Card and Tomorrow is Customer Appreciation Day! Kirkland's - Introduces New Credit Card and Tomorrow is Customer Appreciation Day! 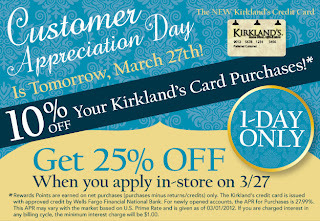 But, I digress....on to the good news...apparently, Kirkland's has come out with a new credit card, and when you apply for it in-store tomorrow, March 27th, you can get 25% off your purchases. If you already have this new Kirkland's credit card, you can still enjoy the benefits of Customer Appreciation Day by receiving 10% off all purchases made with your Kirkland's card.